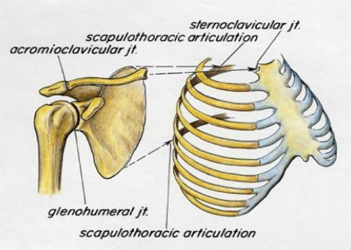 The normal Shoulder is composed not only of the glenohumeral joint (“Ball-in-Socket”) but also the the articulation of the scapula with the chest wall (“scapulothoracic articulation”), the connection between the scapula and the clavicle (“AC Joint”) and clavicle to the sternum (“breast bone”). Normal shoulder motion means that the scapulothoracic joint must move as well as the glenohumeral joint. During this motion the glenohumeral joint moves with the humeral head rotating in the glenoid socket. Use of the arm over the head as in work or sports puts stress on the ligaments which keep the ball in the socket. 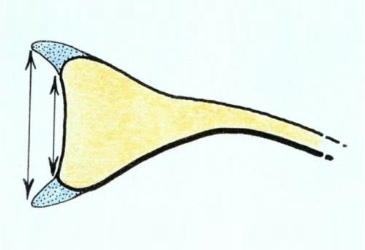 The normal humeral head (ball) is larger than the glenoid (socket). 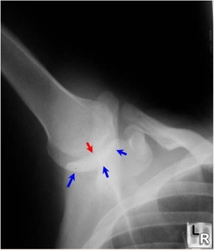 The humeral head (ball) remains centered (red arrows) in the socket (blue arrows) if the scapula moves in proper rhythm with the glenohumeral joint motion. The socket is made broader (wider) and deeper by a flexible rim of cartilage (labrum) which runs along its perimeter. This increases stability by making the socket larger and deeper. The labrum also acts as an anchoring point for the ligaments which stabilize the shoulder joint during shoulder motion. The normal main ligament of the shoulder (inferior glenohumeral ligament) supports the humeral head like a hammock supports a person. With arm rotation, the ligament (hammock) moves forward and backward to keep the ball in the socket during this rotation. Shoulder instability occurs when the humeral head (ball) moves out of the glenoid (socket) during shoulder motion. This is associated with symptoms which are typically pain and sometimes a sense of shifting. If the ball completely moves out of the socket, this is called a dislocation. If the ball moves partially out of the socket, this is called a subluxation. 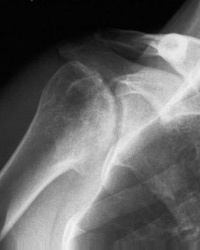 Shoulder instability may occur as the result of a traumatic event such as a football tackle or a fall. It can also occur as a consequence of repeated motions which stretch the ligaments in the shoulder allowing the ball to then move partially out of the socket. 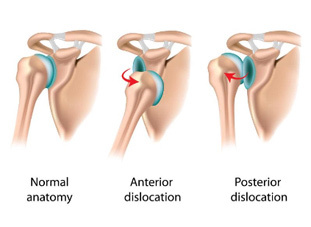 Shoulder instability is usually in the anterior (out the front) direction, though in about 10% of individuals it may be posterior (out the back). 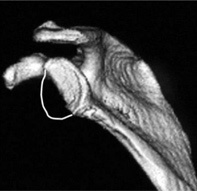 In another 5-10% of cases shoulder instability may occur in more than one direction. This is called multidirectional instability. When sufficient force is applied to the shoulder and a dislocation occurs one or more injuries must occur to the ligaments, cartilage, and labrum in the shoulder. The most common injury is called a “Bankart lesion. 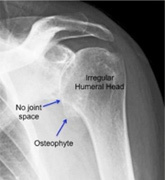 This is a separation of the labrum from the edge of the socket. 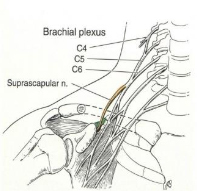 Nerve Injury: The brachial plexus are the complex of nerves that run in the front of the shoulder. When the humeral head (ball) dislocates out of the socket it can stretch or compress the nerves of the brachial plexus. This can result in weakness and loss of sensation (numbness). 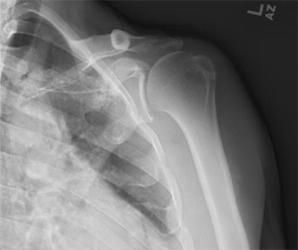 Bony Injuries: In some cases of severe injury, the edge of the socket may fracture or the attachment of the rotator cuff (greater tuberosity) may pull off. 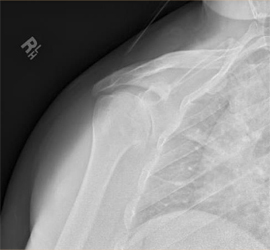 In the case of multiple recurrences of shoulder dislocation, there may be wearing down of the edge of the glenoid socket and development of a divot in the back of the humeral head (ball), called a Hill-Sachs lesion. The shoulder is immobilized in a sling for a period to allow the inflammation and pain to resolve. Return to sports is then possible; however, there is a significant risk of recurrent instability especially in young male athletes. 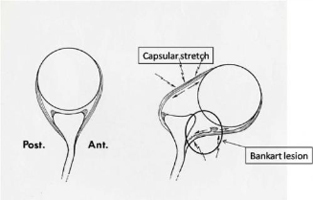 In the absence of a boney injury, the goal ofsurgery is to restore stability by repairing the Bankart lesion and any capsular stretch or rupture. 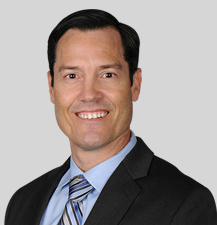 In the majority of cases, this can be performed as an arthroscopic surgery. -This surgery involves placement of anchors (plastic, metal, or absorbable) into the edge of the glenoid socket. Sutures from these anchors are then placed arthroscopically through the labrum and capsule. The sutures are then tied down, reattaching the labrum and capsule. In the case of loss of bone along the anterior (front) of the glenoid socket, a soft-tissue Bankart repair has a high likelihood of failure. 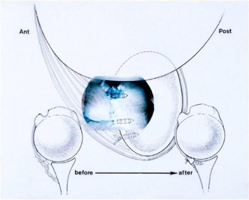 Our approach is to perform an operation called a Latarjet Procedure. It involves transfer of a bone (coracoid process) in the front of the shoulder into the front part of the scapula so that it acts to restore the glenoid socket surface. 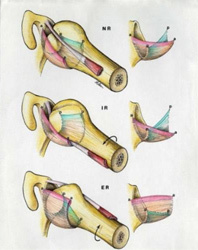 Attached to this bone is a tendon (conjoined tendon) that acts as a sling in the front of the shoulder. 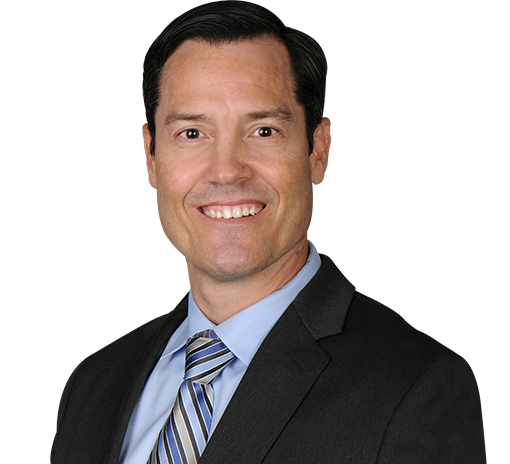 When do you need a shoulder replacement? Shoulder arthritis: A history of progressive loss of motion and pain interfering with sports, work, and eventually daily activities is a typical complaint of patients. Loss of sleep due to pain is also an important complaint we typically hear from patients. Crunching (crepitation), grinding sensations, and catching may also be symptoms the patient notices. Weakness maybe present simply due to pain interfering with your ability to move your arm. Osteoarthritis of the shoulder is a disease that involves breakdown of the articular cartilage that normally allows the joint to glide smoothly with each other. 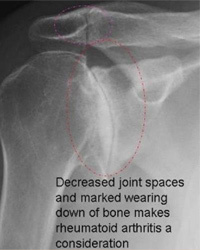 Loss of cartilage is seen on xray as loss of the joint space. Post-traumatic arthritis of the shoulder results when the shoulder joint is injured. This can be a result of bone fracture, dislocation, or damage to the surrounding ligaments/soft tissue around the shoulder joint. Rheumatoid Arthritis and other inflammatory conditions of the shoulder is a systemic disease that can affect any joint in the body. This is a condition in which the lining of the joint (synovial cells) develops inflammation which damages the cartilage and bone of the shoulder. In patients with shoulder pain and arthritis, shoulder replacement maybe an option for treatment. It is recommended for patients with severe arthritis that have failed all conservative treatment modalities. 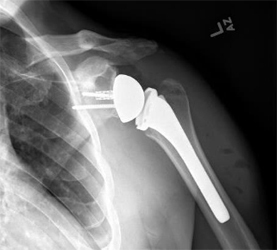 There are three different kinds of shoulder replacements available on the market. 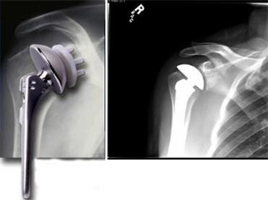 Total shoulder replacement is an excellent operation to improve pain and function in patients with shoulder arthritis. Studies have shown excellent clinical results and long-term durability in patients with TSA. 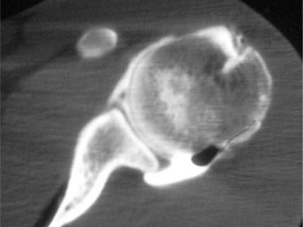 The humeral head or “ball” is replaced with a metal implant made of cobalt chrome and titanium which resembles the head’s native size and anatomy. 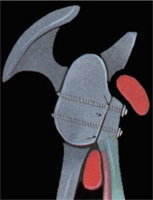 The glenoid, or “socket” is replaced with polyethylene (plastic) that is similar in size and shape to the natural glenoid anatomy. This procedure is typically indicated for patients with arthritis of the shoulder that have intact, or normal, rotator cuff tendons. 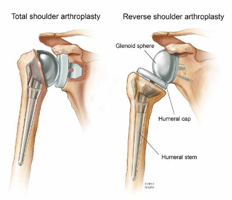 A reverse prosthesis is a newer technology that utilizes a “non-anatomic” shoulder replacement in patients who have shoulder arthritis and are without normal rotator cuff muscles and tendons. 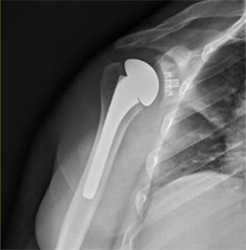 This prosthesis can also be used as a salvage procedure for failed surgery or in older patients with severe fractures of the proximal humerus (shoulder) that may be beyond surgical repair (due to loss of bone or a large number of fracture pieces).